This is a guest post from Philip Taylor, founder and editor-in-chief of PT Money: Personal Finance. Learning about and applying the rules for living a frugal lifestyle are common principles in the area of personal finance. Controlling your budget and spending less can certainly help you avoid the cycle of debt. And that’s a great thing! But there’s a point in most of our lives when we’ve exhausted frugality and we simply cannot save any more or spend any less – and at this point you need to consider how to increase your income. Your financial life is begging for a new perspective; instead of solely focusing on spending less, it’s time to boost your wealth and maximize your earning potential. Within your own situation, your financial needs should direct your immediate, short-term, and long-term goals – and this will in turn dictate the smartest path toward increasing your income. Cleaning out your closets and selling your stuff is a quick and easy way to make some extra cash. Not only will you avoid ending up on the show Hoarders, but you’ll make some extra money in the process. USAA says that the “average rented, two-bedroom residence can contain more than $20,000 in personal property.” That’s a lot of stuff to sell! The formula we follow when my family downsizes our mess off non-essentials is pretty simple: we separate the stuff that’s cluttering up our house into three groups: 1) keep, 2) throw away, and 3) sell. As far as selling goes, there’s a great variety of ways to get paid for your stuff. You could have an old-school garage sell, you could post your items on Ebay (with no charges to post depending on the way you list your items), or you could sell on Craigslist or even Facebook. READ I'm Saving Money But Having Fun, Without Being Frugal. All So I Don't Have to Work. You don’t always have to look outside of your current employer to increase your earning potential. And there’s no shortage of advice when it comes to earning more at your current job. Things like dressing for the promotion you want, networking and building business relationships, having the confidence to approach your boss about a raise, and even moving to a commission-based pay scale can all have positive effects on increasing your earnings. Whatever method you choose will be decided by your current situation at work and what you feel comfortable with. Not every answer is right for every situation. But the common factor found in every job situation is that opportunities for greater income won’t be found if you never look for them. If you’re willing to put in the extra effort and longer hours, a second job can have huge benefits when you’re trying to earn more cash. With stable primary employment, you can take the opportunity of a second job to find something that you’re good at or that you enjoy. It’s mentioned so much because it’s so true; but when you earn money doing something you love, it doesn’t really feel like a job. And not only can you increase your overall income, but a second job could pave the way for a better career or the confidence to start your own business. If you feel stuck in your job, if you’ve been seeking a raise without results, or if you get the sense that you’ve reached your ceiling, the answer to greater income might be to look outside of your current job. Whether you’re looking to stay within the same field of work or change career paths completely, be patient and do your research before you commit. Because you’re considering your options while you’re still employed, you should take your time, study your choices carefully, and make the best decision to benefit you and your family. READ A 12-Step Plan to Get Out of Debt Fast! Just remember, when you pair frugality with an increase in income, you’ll be on the path to greater wealth and setting your own financial future. What Took You Guys So Long to Become Mexican? I’m Saving Money But Having Fun, Without Being Frugal. All So I Don’t Have to Work. Your article makes me feel motivated to actually do some of the things I’ve been thinking of lately – like having a garage sale. My husband has traditionally been the financially wise spouse, but whereas he says of our excess stuff, “Let’s throw it out,” I say, “Let’s sell it.” It does take quite a bit of effort to select, price, and sell items, and it’s tempting to think that the work involved isn’t worth the often low selling price. 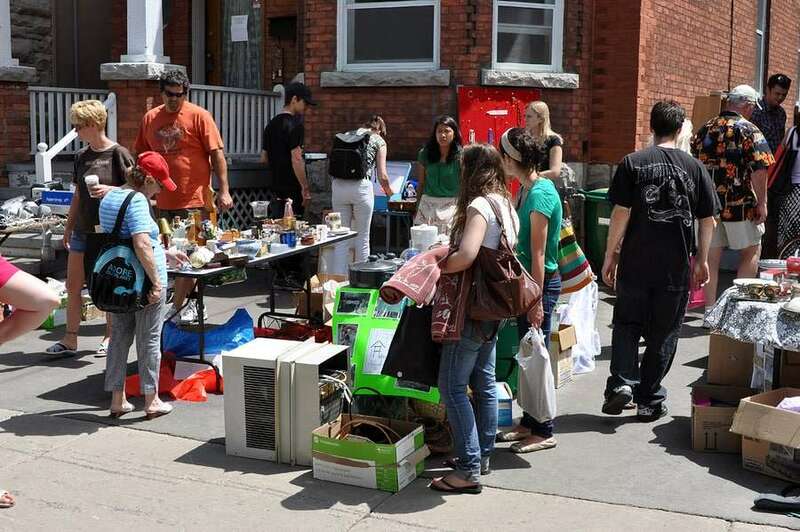 But if it’s a choice between throwing out and earning – I say bring on the garage sale! Well donate whatever you can’t sell and it will be the best of both worlds.